This workbook is designed to accompany section 103 - Actions and Events. Imagine a scenario where you need to interact with whomever mentions your company on twitter. You (personally) don’t want to constantly check in on your corporate Twitter feed, so you need a way to notify both you and your team whenever this happens. 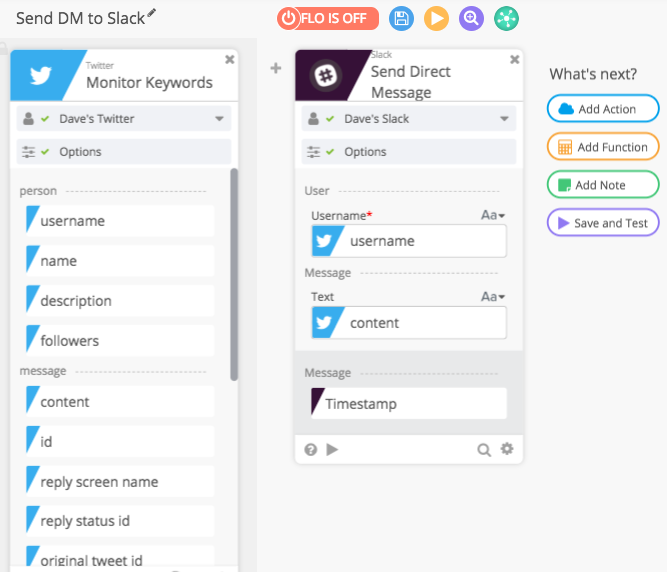 To do this you’ve decided that you want to get a slack message anytime someone mentions your company on Twitter. NOTE: Depending on the keyword (hashtag) you’ve selected, it may take several attempts to retrieve results. Feel free to change your keyword so as to test that the FLO works correctly!